Sick of industrial vacuum cleaners or commercial vacuum cleaners that can’t do the job? Fed up wasting time with blocked filters, continually emptying the machine, and having to redo the work? Here are some great reasons to own a HILTON Dust Eater Industrial Vacuum Cleaner. Read on to find out how these cyclonic industrial vacuum cleaners take care of common vacuum problems. Using Hilton’s A.F.P.T. the Dust Eater range out performs other vacuums of its size to capture the dust and waste from a large range of production processes. The combination of a tuned cyclone and a multi-sock filter system allows maximum airflow and waste separation to ensure a continuous vacuum process right up until the vacuum requires emptying. Filtration built from the high grade HEPA (H13) filter fabric that is engineered to allow MAXIMUM AIRFLOW while stopping the finest dust particles from getting through. Stage 1: Dust laden air enters the vacuum drum chamber and is compressed between the outer wall and the filter skirt. Filters are protected from dust and waste. 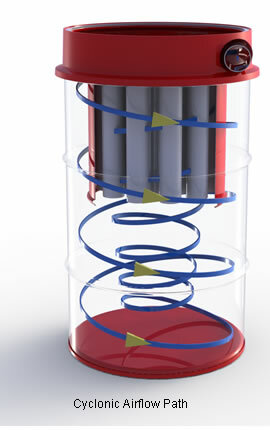 Stage 2: The graduated cyclone channels the air and throws the dust against the outer drum wall. At the wall gravity takes over and waste material drops out of the air stream. Stage 3: At the bottom of the containment drum the cyclone action creates an area of low pressure or Dead Air which keeps waste material from being whipped up to the filters. Stage 4: Clean Air travel in a vortex up to the final filter stage, the multi sock HEPA (H13) filter.